Three Third Period Goals Carried Amerks to a Comeback Win · Let's Go Amerks! The third game in less than 48 hours for the Rochester Americans came down to the final 20 minutes of play and they found a way to erase a two goal deficit and win, mirroring the recent play of their parent team Buffalo Sabres. A win also helped make the five plus hour bus ride home just a little bit easier after a weekend that started off with an embarrassing loss. Zach Redmond scored his team league leading sixth game winning goal team leading 12th goal of the season with less than four minutes to play in the third period to give the Amerks a 4-3 lead. Justin Bailey worked the puck up the side boards, Lawrence Pilut sent a pass from the far side blue line that went off the corner boards and Zach Redmond fired a rocket through the pads of Marek Mazanec. Redmond is being paid NHL money to play with stability in the American League and he’s playing like he has something to prove and he’s proving it. Through 17 games of the regular season his 12 goals are on pace to breaking the league record of 30 goals by a defenseman in a single season. He’s also on the way to breaking the Amerks record for goals by a defenseman in a season which is at 18. The assist by Lawrence Pilut on the game winning goal was his 19th of the season which is leading the league. Pilut also scored at 5:28 of the third period to begin the Amerks comeback. 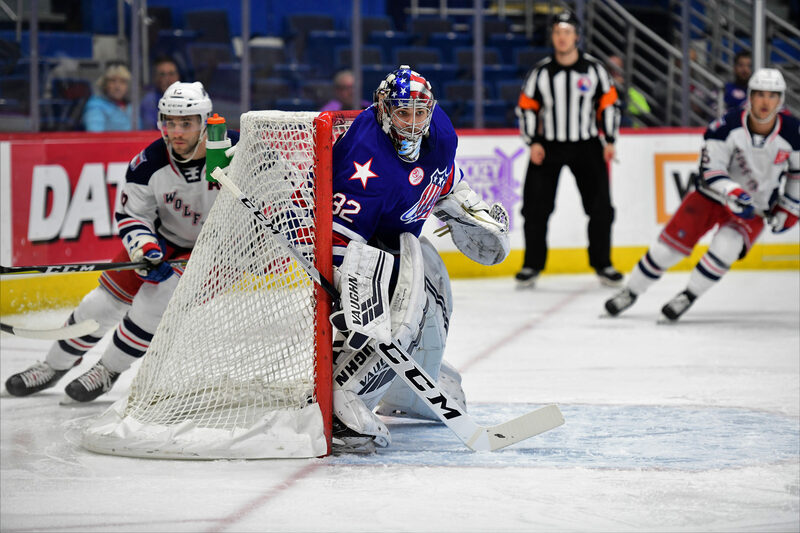 Going back to the start of the game, Peter Holland started off the scoring at 8:12 of the first period scoring off a rebound that was shot by Bobby Butler after he skated around Brendan Guhle into the Amerks zone. Rasmus Asplund scored his first professional goal in North America at 1:45 of the second period with an assist to Victor Olofsson. Olofsson returned after missing the last three games with a lower body injury. He forced a turnover at the blue line that sent the puck out of the Amerks zone, Asplund took off and scored glove side. Gabriel Fontaine scored off a slap shot from the slot at 5:18 of the second and Cole Schneider scored a fluke of a goal to give Hartford a 3-1 lead at 11:53 of the period. Schneider shot the puck from the face-off circle, the puck went high up in the air and as Adam Wilcox was waiting for it to come down it hit the ice and went into the net. Lawrence Pilut started the third period scoring at 5:28 to give the Amerks some hope in the game. Pilut lobbed in a shot from the blue line that found its way into the net. Redmond had the primary assist with the secondary assist to Alex Nylander. Nylander was about to be swarmed by three Wolf Pack players when he sent the puck to Redmond at the point. Adam Wilcox earned his fifth win of the season with a 35 save effort including these four big saves with the Amerks still down by two goals. A goalie can help steal a win and also help a team stay in a game. Wilcox gave the Amerks the opportunity to come back and the team helped him out by doing just that. Danny O’Regan tied the game with 4:24 remaining in the third period with assists to Rasmus Asplund and William Borgen. Asplund carried the puck down the slot and was able to shoot the puck. The rebound popped back out in the middle of the ice where O’Regan was and he scored his sixth goal of the season. It only took another 34 seconds for Zach Redmond to score what would be the game winning goal for the Amerks to finish the weekend with three out of a possible six points. It wasn’t easy getting to that point. The Amerks gave the Wolf Pack five different power play opportunities that could have all been avoided. Brendan Guhle had a lazy interference penalty in the first. Kevin Porter was given a roughing penalty for retaliating after what should have been a penalty on Hartford that wasn’t called. There was two different too many men calls in the second. With 2:21 left in the third and up by a goal there was a delay of game call on Zach Redmond for sending the puck over the glass on a clearing attempt. Rochester was able to hold on for the 4-3 win and build a five point lead in first place over the Cleveland Monsters. Rochester now has 24 points out of a possible 28 in the last 14 games. The Amerks return home this Friday to host Utica at Blue Cross Arena and then they travel to Binghamton on Saturday.